Indian food is famous worldwide for its taste and variety. Prepared from vegetable, herbs and Indian species Indian food has won many hearts nationally and internationally. As our beautiful country comprises 28 states and each state has different religion, culture and food for which it is famous for. Indian food offers infinite cuisines and wide variety. Food is important for all of us; we are longing it for taste but before that we need it for our consumption to have healthy mind and healthy body. If we talk about north, south, east and west region then North Indian food includes flour dishes that is various kinds of chapattis are made from this flour. 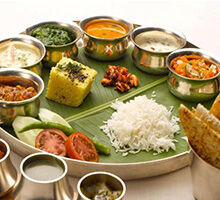 South Indian food includes rich species they eat light yet spicy food. East Indian food includes lot of rice in their dishes and the food that belongs to west includes dals and achar but the best thing is this online world let us enjoy all these flavors in all regions, like we don’t have go to Rajasthan to eat dal bhaati. The online stores like Food Panda, Foodrool, Grocery babu, Khanapkana, Nearbuy, Swiggy, KFC and many others which offers you with delicious and quality food deliver at your doorstep within minutes with the discounts and coupons available on number of dishes. Buy online and buy the Moist chocolate cake at just Rs.150. No coupon code is required to avail this offer. Offer is valid for limited period. Chai Point follows a strict rule of 3-10-20. This stands for delivery process. 3 minutes for the order to be acknowledged in the system. 10 minutes within which the order is dispatched from the time the order is placed. 20 minutes to deliver to your doorstep from strategically placed stores. What's Brewing? Cuddle up with a cup of Green Coffee. Order now and avail flat 10% discount on all products. Hurry to avail this offer to enjoy the deal. Call us at 1800-123-6489 and get free shipping at any time. No coupon code is required. Offer is valid for limited period. Let this Chai bring out the Dum in you! Get Dum Chai at just Rs.219. Dum Chai is slowly brewed in a copper vessel with the lid on to lock the aroma of the tea at a low flame until it reaches a level that brings out the authentic flavor of Chai. A rich dark chocolate cake with ooey-gooey molten chocolate inside. A perfect way to finish a feast. Buy Chocolate Ecstasy at just Rs.90. Check out the promo page for more description. Enjoy the tasty meals starting from just Rs.150 which includes breakfast, snacks etc. at Freshmenu.com without any coupon code. Get the other delicious dishes also at an affordable price. Enjoy the offer before it ends. Order online now and get a small chai flask free at Chai Point. Use the given coupon code at the time of checkout. Offer is only valid on first order. Visit the store and get veg & non-veg buffet meal starting at Rs.699. In buffet meal, 7 veg starter & 5 non-veg starters, 8 veg main course & 6 non-veg main course, salads, desserts, and much more. Don't miss out. Register with GreenBrrew and get Rs.10 on your account by signing up. Avail this offer without using any voucher code. Offer is applicable for new users only! Get 20% discount on pizzas on weekdays Monday to Thursday with the given coupon or promo code. This offer is available for all users. This offer is valid on pizzas only. Enjoy the offer before it ends. Check out the landing page for more details. Terms and conditions are applied. Kulcha is a favorite dish in Amritsar. Get Kulhad Matar kulcha at just Rs.200. No coupon code is required. Grab tasty and delicious variety of cookies and cakes starting at just Rs.20 onwards. Also choose from Categories like: - Indian Chai, Summer Special, Breakfast, Meals, Nashta, Bakery and lot more to explore. No special prom code required to redeem the offer. Order online with Chaayos and enjoy yummy treat in your every meal. Put orders of Rs.400 and above to enjoy flat 20% discount at Freshmenu. This offer is available on Fast-food, Food Delivery and Pizza only. This offer cannot be combined with any other offers. Enjoy the offer before it ends with the use of coupon code. Share your number and get 20% discount on your first order at Freshmenu.com without any coupon or promo code. Enjoy the offer before it ends and save money. Check out the landing page for more details. Terms and conditions are applied. This offer is available on Fast-food, Food Delivery and Pizza only. Visit the store and buy quick bites starting at Rs.35. You can choose Nutty Trail Mix, Chilli Panner Wrap Combo, Burger, California Club Sandwich Combo, and many more listed on the deal page. Now avail flat Rs.20 off when you buy Greenbrrew Green Coffee. Grab the coupon code to redeem this offer. Limited period offer. Put an order for the first time and select your dishes at just Rs.99 only without any coupon or promo code. Enjoy your meal at the best price and save money. Enjoy the offer before it ends. Check out the landing page for more details. Greenbrrew is No. 1 green coffee brands for weight loss. Purchase instant Green Coffee 20'sachets for weight loss at Rs.299. Each sachet contains 3 gms. Welcome to Chai Lovers Club, begin your relationship with "Meri Wali Chai" and great food. Get 10% off on your first order. Use the given coupon code at the time of checkout. Offer is applicable only on first order. One more reason to come to Barbeque Nation! Booking just got much easier and simpler by the app. Download the app and enjoy the deal. Hurry to book your table online. Enjoy delicious desserts starting at just Rs. 50 at Freshmenu. To enjoy this offer no coupon code is required. Enjoy your desserts at a best price and save money. Enjoy the offer before it ends. Check out the landing page for more details. Terms and conditions are applied. Booking a table just got simple. Avoid annoying queues and constantly call. Simply Say Hi on Facebook Messanger and get a table reserved on-the-go. Order online for sweets and buy Sugar-Free Pancham at just Rs.375. It contains Apricot, Sugar-Free Liquid, Cashewnuts, Raisins, Clarified Butter, Almonds, Pistachio, and Cardomom. Store in a cool and dry place away from direct sunlight. Grab Rs100 OFF on all Biryani orders. The minimum order value for all orders is Rs.350. Want to lose weight? Try our natural detoxifies GreenBrrew Unroasted Green Coffee for Rs. 299.00. It is an instant and unroasted coffee bean extract in the form of the powder which comes from organic cultivated farms. Don't miss this deal. Experience the taste of authentic filter coffee at every sip! Order filter coffee at just Rs.129. Hurry to avail this offer. Put an order above Rs.400 and get free desserts worth Rs.90 on weekdays Monday to Thursday only. To avail this offer apply the given coupon code at the time of final payment. Get the other delicious dishes also at an affordable price. Enjoy the offer before it ends. Buy sweets online from Ganguram Sweets, Kolkata and buy Kaju Pista Roll at just Rs. 450 (500gms). It contains Cashews, pistachios, sugar, silver leaves. Don't miss this deal. Now get Rs.20 cashback when you pay with Paytm 2 times at Nearby shops. Offer is applicable for all new and old customers. The minimum amount of each payment should be Rs.20. Cashback will be credited to your Paytm Wallet within 24 hours of completing the offer. Get flat 30% off on 11 premium biryanis. The minimum order value is Rs.199. Varieties are available like Dum ghosh, Falafel and many more. Apply coupon code at the checkout page and grab the offer. Enjoy Flat 20% discount on your order with given coupon code. Spend minimum Rs.199 on your order and enjoy up to the discount of Rs. 100. This offer is applicable only on Classic Faasos section. This offer is not valid on combos, beverages & MRP products. Behrouz Biryani is giving extra 25% cashback on paying through your amazon pay wallets. The offer is applicable for all users. No coupon code required. Use for one time per user, during the offer period. Catch out the delicious treat today. Enjoy the delicious food at a reasonable price. Deal starts at Rs.320. All prices are inclusive of taxes. Grab the deal to redeem this offer. Enjoy buy 1 get 1 free on your first order at Faasos. This offer is available at Classic Faasos Section only. This offer is not valid on combos, beverages & MRP products at Fasoos. Check out the landing page for more details. Terms and conditions are applied. Enjoy the offer before it ends. Visit the store and get your favorite chai delivered in 30 minutes. No need to apply the coupon code at final payment. Check out the promo page for more details. The tanginess of tamarind and the ‘chatpata’ taste of jaljeera combined with our freshly brewed Chai make this drink a refreshing summer favorite! Order Imli-Jaljeera Ice Chai at just Rs.69. Offer is valid for limited period. One more way to show your love by gifting Barbeque Nation gift vouchers. Gift vouchers start from Rs.500. Offer is valid for limited period. Barbeque Nation offers free meals to children below 6 years old. Please visit the offer page for more details. Are you a Bengali Sweets' lover? Visit Foodwalas and buy Bengali Sweets an affordable price. Offer starts at Rs.200. Coupon code is not required to avail this offer. Subscribe to the newsletter and get free shipping, gift voucher on your first order, straight to your inbox. Also get exclusive promotion and the latest word on our great foods brands, new products, and seasonal gifts. Behrouz Biryani is giving extra flat 50% cashback via amazon pay wallet for all users. Offer is valid once per user. Cashback will be Rs 100 per order. Offer is applicable for the first time or new amazon pay wallet users. Cuddle yourself with green coffee. Now get flat 10% discount on all products. It helps in weight management, boost your energy and it’s a natural detoxifier. Browse for the different flavors and buy the best. Free shipping is available. Save Rs. 30 on order of salads at Freshmenu. To grab this offer apply the given coupon code at the time of final payment. This offer cannot be combined or clubbed with any other offers. Enjoy the offer before it ends. Enjoy this delicious food with the best price at Pind Balluchi. The main course starts at Rs.199. Offer includes various categories of the main course. Please visit the offer page for more information. Buy handpicked an amazing variety of exotic dry-fruits and get 10% off on Exotic Dry fruits. Use the given coupon code at the time of checkout. Offer is valid for limited period. Enjoy unbeatable value at Disney's tasty food outlets. Get Hong Kong Disneyland Meal Coupon at Rs.732. Save your time and money while enjoying delicious food with various meal coupon options. Order online and get free delivery. Offer is applicable on orders over Rs.350. You have to pay delivery charges of Rs.60 on order below Rs.350. Don't miss this deal. Fine flour bread cooked in tandoor and layered with butter. Pay just Rs.48 for butter naan. Hurry to avail this offer before it ends. Get the tasty, healthy and delicious soups starting from just Rs.105. Get the other delicious dishes also at an affordable price. Check out the landing page for more details. Terms and conditions are applied. Enjoy the offer before it ends. Samosa is the signature snack of Indian food culture. Buy Ghasitaram Farshan Samosa at just Rs.156. It is purely vegetarian. It contains all-purpose flour, masala filling, and other spices. Its life is 60 days. It should be stored in an airtight container. Visit the store and order snacks online. Price starts at Rs.12. Offer includes Bun Omelette, Cinnamon Roll, Aloo Herb Turnover, Masala Bun Maska, Chai Masala Cake, Brownie, Choco Chip Muffin, and much more shown on the offer page. Grab the deal to redeem this offer. Put orders above Rs 1499 and get free Big Belgian Chocolate Cake without any coupon code. Not applicable on MRP products, value combos, and beverages. It cannot be combined with any other offers. Check out the landing page for more details. Stay tuned to get the latest deal for big savings. Visit the store and avail a discount of 5% when you buy sweets, dry fruits, staples & snacks. Coupon code is also available. Hurry to save the money. Checkout this exclusive offer and avail it today! Now get Rs.15 off on your first order with GreenBrrew and enjoy. Explore offer page and buy online products to save more on your shopping. No special GreenBrrew coupon code required. Subscribe to our newsletter and get news & special offers twice a month. Hurry to subscribe now. Order online and enjoy 20% flat off on every order at Paratha Junction at Bangalore. More offers are displayed on the deal page. No coupon code required. Discount and offer may vary from order to order. Offer is valid only on delivery orders, and cannot be availed for pick up orders. Stay cool and fresh with our range of summer treats. Get kulfi shake (350ml) at Rs.194. Don't miss this special summer offer. Enjoy 25% off on your first order of main-course with the use of given coupon code. The maximum amount of discount is Rs.100 on this offer. Enjoy the offer before it ends and save money. Check out the landing page for more details. Terms and conditions are applied. This offer is available for one time only.